The HAL Dhruv (Sanskrit:"Pole Star") is a multi-role advanced helicopter made by Hindustan Aeronautics Limited (HAL). It is currently being supplied to the Indian Armed forces (Indian Coast Guard, Indian Navy, Indian Air Force, Indian Army); a civilian variant is also available. The type has been exported to Nepal and Israel , and is currently being considered by Chile. Specialised military variants will eventually include ASW machines and helicopter gunships. Hindustan's Advanced Light Helicopter (ALH) programme was first announced in November 1984, but progress was slow. Even after the first prototype flew in August 1992, problems arose due to the changing demands of the Indian military, funding, and contractual issues with MBB, which was the consultant for design. Further obstacles were created by the US sanctions after Indian Nuclear Tests in 1998, which embargoed the engine originally intended to power the helicopter. Deliveries of the 300 machines on order finally commenced in 2002, a full ten years after the prototype's first flight, and nearly twenty years after the programme was initiated. Sixty four Dhruv's were delivered to the Indian armed forces in 2006. The Dhruv features a 'System Bolkow' four-blade hingeless main rotor with carbon fibre composite blades. The blades have advanced aero foils, swept back tips for reduced noise, and feature a ballistic tolerance against bullet hits of up to 12.7mm calibre. The fibre elastomer rotor head holds the blade between a pair of CFRP star-plates, with manual blade folding and a rotor brake provided as standard equipment. A four blade bearing-less crossbeam tail rotor is fitted on the starboard side of the pylon. Vibration damping is provided by an anti-resonance isolation system compromising four isolator elements between the fuselage and the main gearbox. An integrated drive system transmission comprises the rotor hub, main transmission, upper controls and main rotor hydraulics. The naval variant also has a retractable tricycle gear, a folding tail boom, a harpoon deck-lock, pressure refuelling, fairings on fuselage sides to house the main wheels, flotation gear and batteries. The Dhruv also features a four axis automatic flight control system, with an integrated control & stability augmentation system from France. The airframe makes extensive use of composites (Glass Fibre, Carbon and Kevlar) and accounts for 29% of overall structural weight and 60% of surface area. The military variants include crashworthy fuel tanks, frangible couplings and infra-red suppressors for the engines. 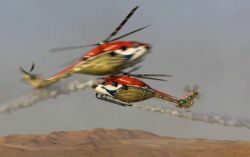 The helicopter design enables the crew to survive vertical impacts of up to 30 feet per second, due to the safety seats and a design of controlled deformation of fuselage crumple zones. The cabin was designed to seat 12 people, however 14 can be accommodated in a high-density configuration. Rearward-sliding passenger doors are featured on either end, with large clamshell doors at the rear of the cabin. The clamshell doors can be removed, in exceptional cases, to carry unusual & unwieldy loads. An underslung load hook is standard on military variants. The air ambulance variant enables the Dhruv to accommodate two to four stretchers, with a couple of attendants. Dhruv helicopters of the Sarang display team at the Aero India 2007. The Dhruv was originally powered by a pair of TM333-2B turbo shafts developing 746 kW (1000 shp) from Turbomeca of France. This was later switched to the LHTEC CTS800-4N turbo shaft (from the then Allied Signal of USA - now Honeywell) developing 970 kW (1300 shp). The more powerful CTS800-54 turbo shaft developing 1235 kW (1656 hp) was offered as an option. However, these engines were embargoed by the US, for imposing sanctions on India for her nuclear tests in May 1998. Connections were re-established with Turbomeca and the TM333-2B2 engine was selected, developing 825 kW (1100 shp) at take-off, with growth potential to 900 kW (1200 shp) for subsequent versions and features full authority digital electronic control (FADEC). 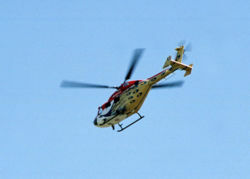 AIN Online reported in February 2004 that Turbomeca will supply 318 TM333-2B2 engines to HAL for the series production. The journal also stated that Turbomeca has agreed to increase the offsets associated with this deal by transferring more work to HAL, which will now produce the engine's turbocharger and other accessories, including the fuel systems. HAL will also be securing repair licenses for the engines. The Indian Army tested the Dhruv in the 1999 Kargil war against Pakistan. While the advantages in hot-and-high performance parameters and altitude limitations were obvious when compared to the HAL Cheetah, the Army wanted more out of the TM333-2B2 engine. Thus a Memorandum of Understanding (MoU) was signed on 12 September 2000 between HAL and Turbomeca to develop a turbo shaft more powerful than the TM333-2B2 engine. Called Shakti in India and Ardiden 1H in France, the engine is expected to develop 900 kW (1200 shp). The engine is set to complete its first test bed run only in mid-2005. Around 300 to 350 Shakti/Ardiden-1H engines, worth $400 to $500 million in total, are expected to be produced at Bangalore under the deal. The first engines will not be ready before 2006 and will replace the existing TM33-2B2 engines on the production line. The engine will eventually be the standard power plant on the Dhruv and earlier production examples that entered service with the TM333-2B2 engine, will be retrofitted with the new engine. HAL has an 11% stake in the overall program and Indian engineers are based at Turbomeca's headquarters at Bordes in the southwest of France to assist with the development. Displaying at the Farnborough Air Show 2006. The naval variant (also used by the Coast Guard) will feature the SV2000 maritime patrol radar developed by DRDO's Electronics & Radar Development Establishment (LRDE) for surveillance. The radar has the capability to detect and track airborne targets, sea surface targets (i.e. frigates) and sub surface targets (i.e. submarines) under sea clutter at a range more than 50 nautical miles (92.6 km; 57.58 miles). The radar is optimised to detect and track targets which have small RCS (Radar Cross Sections) like sea skimmer missiles (i.e. Exocet anti-ship missile) and low flying aircraft under sea and weather clutter conditions. The radar has been developed using special techniques with the frequency agility and coherent processing to detect targets under sea clutter. Advanced algorithms provide reliable performance under jamming conditions. The radar is built to perform two roles: a primary and a secondary role. Under the primary role, the radar performs sea surface surveillance for ships, vessels, submarines and air space for low and high altitude flying air targets. It supports navigation, weather characterisation and beacon functions as secondary roles. After a rigorous testing process, the radar has been accepted by the Indian Navy, however some fine tuning will be conducted before production begins. The naval variant will also feature the Mihir sonar (dipping configuration) developed by DRDO's Naval Physical Oceanographic Laboratory (NPOL) in collaboration with the Indian Navy's Weapons & Electronic System Engineering Establishment (WESEE). The system is currently undergoing demonstration trials and production will take place at Bharat Electronics Limited (BEL). A forward looking infra-red (FLIR) turret will be fitted on the naval variant and the system will likely come from either France or Israel. Other features in the naval variant include a loud hailer, troop seats and a life raft among others for various mission requirements. A communication radio (U/UHF, HF/SSB and standby UHF modes), IFF & intercom, with a Doppler navigation system, TAS system, radio altimeter and ADF are standard in all variants. A weather radar and the Omega navigation system is optional on the naval variant. In November 2004, one of the two ALH Dhruvs sold to the Royal Nepal Army experienced a hard landing which damaged its undercarriage and landing gear. The damage was subsequently repaired by a team from HAL. A year later, on November 25, 2005, an ALH which was being ferried for delivery to the Jharkhand government crashed in the southern Indian state of Andhra Pradesh, though none of the occupants was harmed. In a statement, HAL said, "In a recent incident, when the tail rotor of one Dhruv developed some technical snag near Hyderabad, the pilot executed a safe landing without any injury to any of the passengers. The incident undoubtedly proved the safety features of ALH including crash worthiness & ease of handling emergency procedures. It was also proved beyond doubt that the design characteristics of ALH are unique as the crew and passengers descended from 5000 feet and came out of the helicopter without a scratch." Nevertheless, the 65-strong fleet operated by the three armed forces and Coast Guard was grounded briefly, while HAL investigated serious tail-rotor defects, which were later fixed. On February 2, 2007, an ALH from the Sarang helicopter display team of the Indian Air Force crashed outside Bangalore, killing its co-pilot Sqn Ldr Priye Sharma and wounding pilot Wg Cdr Vikas Jetley. HAL has dismissed suggestions of another material failure. A crash inquiry by the IAF's Training Command and HAL found it to be a pilot error. The pilot miscalculated the height before pullingup during the aerobatic show. The helicopter team performed in the airshow. This page was last edited on 6 March 2007, at 09:38.